So I’ve been doing a lot of posts lately. What can I say? I’ve had a great week and am getting back to myself! Thank goodness. I have even been back on the victoza for a week and been having a good response! No nausea. Hurray! Cross fingers it will continue. That said- I would like to confess an addiction. I love reality tv. Now when I say reality tv I am not referring to the Jersey Shore, Keeping Up with the Kardashians, Jon and Kate Plus 8 style of shows (never gotten into those). What I like are the reality competition shows. I say this fully admitting the shows are stilted and cast for character types but I still find them entertaining. They are kind of addicting. Once you start watching you want to know who is going to win. I’m just a sucker! 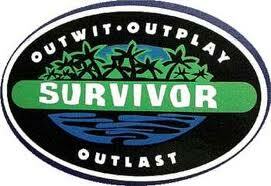 Survivor- Today was the end of the 22nd season of Survivor. I have not watched every season but have followed the last 5 or 6 seasons. I guess this is what you would call a guilty pleasure. I’m not even going to defend it on any level. It does prey on the worst in human nature and the editing is manipulative; however, I just find it entertaining. I like guessing who is going to win. Who has the best strategy? Who is going to win the social game? Who will the jury pick? Will they play the idol? Sometimes I have no idea who will win (Survivor: All Stars- who picked Sandra?) and other times I know from practically day one (this season Rob was the clear winner. Everyone else seemed like a total pawn, amateurs). Like I said. I’m not going to defend it. I just enjoy it. Project Runway- Another show which completely casts for characters not talent, but it is still amazing what the designers do. The challenges are insane. I know its ridiculous, but I just find it addicting watching talented people make outfits out of grocery store objects, items from a car, dresses out of paper or outfits made of flowers. Who thinks of these things? In addition, unlike America’s Next Top Model (a show I never got into. Tyra is so annoying) it actually creates successful designers (has there been one truly top model out of ANTM?). I think Christian Siriano is the most successful winner but he was also a part of the best, most competitive season. My favorite challenge of Project Runway was season 2. The entire dress had to be flowers/plants! Amazing Race- My last favorite is the Amazing Race. This is the show I want to be on some day. I think it would be so much fun to travel around the world doing crazy challenges. When I get in super good shape I want to sign up and my dream is to go with my Dad. He would be a great partner. He is so good at maps, orienteering, puzzle solving and anything athletic. Plus, I think it would be an awesome bonding experience.I don’t think a father-daughter team has ever won. Who knows? Something I like about the Amazing Race is that you do not have to be mean to win the game. While there is some strategy involved, it seems like usually a really nice team wins the game. Because it doesn’t involve voting the strategy is not quite as fierce. In the end its about who crosses the finish line first. This season was a great All Star season and Keisha and Jen won. I kind of wanted the Cowboy’s to win but the girls seemed very nice too. It was a great win particularly when you think about the fact they lost last time because Jen had to go to the bathroom before checking in! The one thing I wonder about is how in the heck do they come up with these challenges? I would like to see a behind the scenes episode of The Amazing Race. It would be interesting to know how they decide where to go and what the road block and detours are. The two most memorable to me are the watermelon catapult from the previous season and the needle in the haystack in Poland. Crazy! One last thing about the Race. Do not go on the Amazing Race if you are scared of heights or water. Every season there are challenges for both without fail and every season there is someone moaning and groaning. Although, I can’t really talk because I’m sure my fear of animals would be seriously put to the test. Bring it on! Anyway, that’s my confession…what’s your secret tv guilty pleasure? Come on. We all have one!